A review of David Bellos's Is That a Fish in Your Ear? A version of this article appeared in SWET Newsletter, Number 130, May 2012, pages 72-85. What is translation? What does Bellos mean? | The range of "translation" | The nature of hon'yaku | The enemy of community? Paperback edition of Is that a fish in your ear? 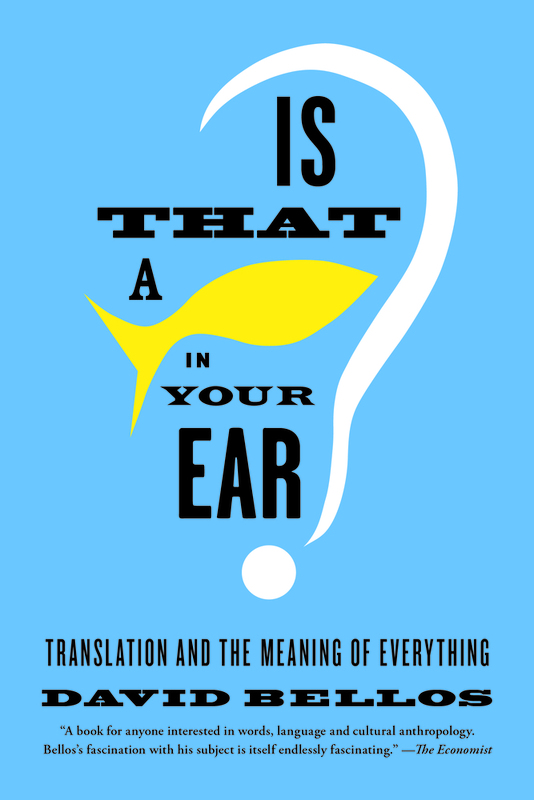 An interesting but unimportant question, says David Bellos in the prologue to Is That a Fish in Your Ear? "This isn't a book that tells you how to translate, or how I translate" he writes, noting that there are already a lot of good ones already out there. "Instead, it is made of stories and examples and arguments that circle around what seems to me to be the real issue -- understanding what translation does." Bellos grew up in England and now lives in the United States, and this, he says, is why the book's viewpoint is located in the English-speaking world. His main reason for writing it? "Because English is currently the dominant interlanguage of the world, English speakers who aren't involved in translation have a harder time than most others in understanding what translation is." A professor of French and comparative literature at Princeton University and the director of its Program in Translation and Intercultural Communication, Bellos has a lot to say in his book about French and translations from French into English, including his own. German, Russian, Arabic, Chinese, and Spanish -- and Latin, Greek, Italian, and Hebrew -- also get more general attention than Japanese. Korean gets one mention. Why, though, would anyone involved in translation from or into an East Asian language want to read a book seemingly so centered on English and the languages of continental Europe? Why read even the first chapter ("What Is a Translation?") -- which begins with a sixteenth-century French poem, ends with an English version of it, and implies that anyone who could explain why the English version "counts" as a translation wouldn't need to read the book? One doesn't have to understand a word of the French poem (I didn't), or make more than superficial sense of the English version (I couldn't), to appreciate Bellos's show and tell -- which demonstrates that the "variability of translations is incontrovertible evidence of the limitless flexibility of human minds" -- hence there could "hardly be a more interesting subject." The rest of the book's 32 short chapters illuminate the universal conditions of human contact and exchange, past and present, with a highly enlightening and entertaining mix of erudition and humor that cannot help but provoke fresh thought about the nature of translation everywhere. So as not to give the impression that I am killing Bellos's book with praise, let me comment on some of the wrinkles that make it even more interesting. Bellos observes that English, for the moment at least, has become the world's "one central language" (p. 293), and today it has more nonnative speakers than any other (p. 19). Partly because of this, the teaching of foreign languages in the English-speaking world has precipitously declined over the past half century (p. 270). Still, I would think that speakers and writers of any language, who have never been engaged in translation, would have a difficult time understanding what it is. Even polyglots and veteran translators will not know what Bellos thinks it does and doesn't, and hence is and isn't, without reading his book -- which circles translation issues in the manner of a roller coaster. The ride is thrilling but can leave one dizzy and disoriented. "Beating the Bounds: What Translation Is Not" (Ch. 29) first claims that, "Like language itself, translation has no rigidly fixed limits, and similarly fuzzy borderlines can be found in other arts." By the end, though, one side of translation "is as unbounded as the line of a shore" while "other boundaries are clearly marked." Does this mean that even "clearly marked" boundaries are not "rigidly fixed" but somehow "fuzzy"? Does opinion matter? Bellos dislikes the "woolly use of the word translation" to describe such things as knitting -- but also film and stage adaptations of novels. In "Under Fire: Sniping at Translation" (Ch. 30), after criticizing the negativism he finds in a lot of commentary on translations, especially of literature, Bellos objects to the teaching of "rightness" in language classes that use translation as a tool for learning. "A translation is more like a portrait in oils" than a school quiz, he says, in the sense that whether a portrait is a "good likeness" in the eyes of someone who knows the sitter is not just a matter of being right or wrong. However, users of a translation "don't have full access to the model (they wouldn't need the translation if they did)" -- hence have "no choice but to trust the translator." Much earlier, in "Meaning Is No Simple Thing" (Ch. 7), Bellos states that "the only way of being sure whether an utterance has any meaning at all is to get someone to translate it for you." In "Words Are Even Worse" (Ch. 8), he remarks that, "A desire to believe (despite all evidence to the contrary) that words are at bottom the names of things is what makes the translator's mission seem so impossible." Yet "Translation is meaning" he declares -- then asserts that metaphors and other "figures of meaning" are "fuzzy ways of holding down the irresistible desire of words to mean something else" -- rhetorical "fun" he adds, but ultimately "eyewash." Bellos has lots of serious fun. His final chapter comes to this Thoreauesque stop (ellipses mine).
. . . the practice of translation rests on two presuppositions . . . we are all different . . . we are all the same . . . Without both . . . translation could not exist. Nor could anything we would like to call social life. I'm sure I understand what this means -- I think. In "Global Flows: Center and Periphery in the Translation of Books" (Ch. 19), Bellos asserts that "Translation is the opposite of empire." But I don't think he means empire hasn't been a part of the human condition. Bellos recognizes that some languages, including English, have initially spread through colonial expansion. He might also acknowledge that translation has contributed to the rise as well as the spread of some imperial states, such as the recent empire of Japan. However, he dismisses "economic, military, and political explanations of the translation map of the world today" in favor of cultural considerations. At the end of "Global Flows" Bellos plunges into a linguistic solar system with "the all-mighty English sun" at its center -- around which orbit a couple of major planets and a few minor outer planets, and "myriad distant satellites no weightier than stardust." This solar structure "wasn't designed by anyone" he says -- and it contradicts "the weblike network of cross-cultural relations that most people would like to see." He then sharply banks toward another figure of speech. But the orbital image of translation flows is only a metaphor. The structure of global translation is not a natural phenomenon but a cultural one. If enough people really want it to change -- it will. (p. 216). But isn't the "nature/culture" dichotomy not also just a metaphor? And one too often invoked to draw sharp lines between phenomena that are not so artificially separable? Even if one links "translation" and "intercultural communication" as closely as Bellos does, much of what he writes in his book suggests that the huge disparities in the "trade" of translated works today would better be understood as a moment in the "natural" history of humankind -- which appears to remain politically, economically, militarily, and even culturally very red in tooth and claw. It seems a bit romantic to reduce the prospects of changing the translation map to a democratic imperative that presupposes "most" or at least "enough" people not only wanting weblike linguistic and cultural networks, but having the means to spin and protect them. But to rule out that Bellos's book is not just an "eyewash" of metaphors but has meaning, must I ask someone to translate it for me? Could I trust an Android that dreams of electric sheep? Bellos advises readers to use Google Translate only to render something "into a language in which you are sure you can recognize nonsense" (p. 256). I could wait for a Japanese translation, but how would my Japanese brain know whether it would qualify as one of the "innumerably many acceptable translations" possible for "any utterance of more than trivial length" (p. 8)? Well, my Northern California English brain would have to comprehend Bellos's English. Though rapidly deteriorating, it assures me it can still grasp the drift of his prose -- in which case I am not supposed to need a substitute for the original. Alas, I am reviewing the U.S. edition of his book -- not the earlier U.K. edition, and not his manuscript. I am reading what Bellos calls his English minus what editors have changed (p. 191). "Why Do We Call It 'Translation'?" (Ch. 3) introduces "translation" as the name of both a product and a process involving a "work" or "text." Some languages, though, have separate words for "the many things that in English all go by the name of 'a translation'" -- Japanese, for example. Bellos's principal guide to "translation" in Japanese is Michael Emmerich's essay "Beyond Between: Translation, Ghosts, Metaphors" in the May 2009 issue of the online "international literature" magazine Words Without Borders. [Note 1] Emmerich's article is not without interest, but it takes Bellos only to places of interest to Emmerich. And Bellos snaps pictures only of places that interest him. Bellos cites a substantial part of Emmerich's long list of yaku 訳 compounds for different kinds of translation with their English glosses. He does not, at this point, cite hon'yaku, about which Emmerich's article says a lot. Instead, he baits a hook he then warns readers not to bite. See also Emmerich, "Burning the Bridge," SWET Newsletter, No. 116, July 2007. After a brief discussion of hypernyms (flower) and hyponyms (rose, camellia), Bellos says Japanese could be seen to lack a general word for translation, whereas English lacks a "readily available set" of words for different kinds of translation. He cautions, though, that this should not be taken to mean that English -- because it has a general word and "could easily accommodate new coinages to give meanings to the Japanese terms -- uptranslate, downtranslate, newtranslate, retranslate, cotranslate, and so on" -- is superior as a "thinking" language. The "new coinages" remark, made in passing with no "Believe this at your own risk" disclaimer, is at best misleading and at worst wrong. Compounding up-, down-, new-, re-, co-, or anything with translate could not "give meanings" to the Japanese terms. Whether glosses or translations, they could only represent (or misrepresent) them. A little fish in my ear [Note 2] tells me retranslate and cotranslate are old coinages with many meanings, including those of respectively kaiyaku 改訳 (but also jūyaku 重訳) and kyōyaku 共訳 (and the now archaic gōyaku 合訳) -- and that existing expressions like "new translation" and "newly translate" would obviate the need for newtranslate as a "loan translation" of shin'yaku 新訳. The same fish tells me downtranslate and uptranslate are offered as "calques" for shitayaku 下訳 and uwayaku 上訳 -- which it would gloss "draft" (preliminary) and "vetted and polished" (finished) translation. It also warns me not to confuse them with "translation UP" and "translation DOWN" -- the terms Bellos invented (his small caps) to denote the direction of translation between tongues of higher and lower utility, authority, power, or prestige (Ch. 15). [Note 2] To catch a small fish that, stuck in an ear, can translate the meaning of everything -- even the title of Bellos's book, between all languages everywhere, including those of different species -- troll the bottomless depths of Cyberspace for "Babel fish" and The Hitchhikers Guide to the Galaxy (p. 270). "How Many Words Do We Have for Coffee?" (Ch. 14) raises the specter of the long discredited but still popular "Great Eskimo Vocabulary Hoax" about Inuit languages having a large number of words for different kinds of snow (p. 157). Readers who chase the fine print in the back notes will discover that Bellos thinks it "pointless" to count all the word forms another language might construct with suffixes and prefixes added to a stem word, indicating "qualities and roles that in English would be expressed by many separate words" or "complex expressions" (p. 346, n. 2). Back, though, to Bellos's Japanese vocabulary problem. English may not be a more thought-enabling language, yet "it is not so obvious how we could translate the general or abstract notion of translation into Japanese" -- so one might be inclined to think that Japanese is "deficient in precisely the respect in which it is richer than English." Closely paraphrasing some of Emmerich's remarks, he goes on to say this. Ergo, attempts to translate "translation" using the word hon'yaku are "subtly" a sort of goyaku 誤訳 or "mistranslation" Bellos says, citing Emmerich -- then ventures, in his own words, that "Hon'yaku is more like a term of art, whereas we think that the English term translation names something general of self-evident reality." Why, one might ask, could this be a problem? Having snagged us with this rebaited hook, Bellos goes on to talk about his real concern -- the "nature" of translation, mostly in the stream of "Western thought" about language. He has no further need for Emmerich's article, but it is worth noting here how his use of "translation" differs from Emmerich's. Emmerich defines "translation" as "any change wrought upon a piece of writing that makes it accessible to a new audience with particular needs or preferences" -- a "very broad definition" he says, and "appropriate" for him as "a scholar-translator who works with Japanese books." This would be unsuitable for Bellos, though, who needs the word for speech as well -- and opposes its use for media transformations, which would exclude film, Takarazuka, manga, and video game adaptations of Genji monogatari. Bellos also seems to regard translation as conservation -- not an endeavor to "change" a work to accommodate the "needs" much less the "preferences" of readers of another language -- but a quest to skillfully capture its recognizable features. In "What Translators Do" (Ch. 28), he says they "find matches, not equivalences, for the units of which a work is made, in the hope and expectation that their sum will produce a new work that can serve overall as a substitute for the source." The English version of the French poem he introduced in Chapter 1 is a translation, he adds, because it "matches many (but not all) of the semantic, stylistic, and formal features of the source." Bellos says he writes the way he likes and leaves the madness of deciding what is and isn't "English" to a copyeditor, who amends his prose "to make it conform to the style appropriate to the output and the target audience of a particular publishing house." His manuscripts get "de-Britted" when edited for publication in the United States, and "de-Yanked" by British publishers -- less difficult, he notes, because he uses very few Americanisms (p. 191). How, I began wondering, might either the U.S. or U.K. editions of Is That a Fish in Your Ear? be "de-Angloed" and otherwise amended in a Japanese edition -- assuming a publisher feels the book warrants translation? How, in the first place, could it be translated without a Japanese term equivalent to the meanings Bellos imputes to and withholds from "translation"? Bellos understands what a translator might do. Could the range of hon'yaku 翻訳 be stretched to include speech? There are "speech-to-speech translator" applications and devices, and some Japanese terms for "machine" or "automatic" translation use hon'yaku inclusive of speech. But the word most commonly used in Japanese for speech translation or interpreting of the kinds that Bellos talks about at length is tsūyaku 通訳 -- which is not on Emmerich's list of yaku compounds, since he is concerned with literature and writing. Tsūyaku would certainly be a better match for Bellos's "oral translation" than what Google Translate suggests. GT's Japanese version of "The Long Shadow of Oral Translation" (the subtitle of Chapter 11) is ooraru hon'yaku no nagai kage オーラル翻訳の長い影 -- which it "back" (or rather "front") translates "Oral translation of a long shadow" -- while "oral translation" alone comes out keikō hon'yaku 経口翻訳, implying that a translation is something to swallow like a pill. Come to think of it, some people have become addicted to translations of Murakami Haruki after just one dose. The compounds hon'yaku 翻訳 and tsūyaku 通訳 are themselves compounded as either 翻訳・通訳 or 通訳・翻訳, with or without the middot. And these expressions are compacted as 翻通 (hon-tsū) or 通翻 (tsū-hon) -- which could be verbalized with する (do), or prefixed to 者 (person), 業 (industry), 論 (theory), 研究 (studies), whatever. But why go to such trouble? For in principle, yaku and its verb forms yakusu and yaku suru also embrace both hon'yaku and tsūyaku -- so they, too, could be used to translate "translate" when referring to both writing and speech. Bellos says that users of English are "wise enough" to know when "translate" refers to some sort of transformation unrelated to "translation itself " (p. 312). True -- if, in a phrase like "translate a ball of wool into a sweater," they understand the other words. By the same token, if I were to "mistranslate" this ke'ito dama o seetaa ni hon'yaku suru 毛糸玉をセーターに翻訳する, readers of Japanese would be smart enough to imagine that hon'yaku meant nitto ニッ ト or ami 編み. To ensure they did, I could show one or both of these words as rubi (furigana) reading aids. Savvy users of transliterations like toransureeshon トランスレーション and toransureeto トランスレート, and their suru verbs, are in fact able to differentiate their various meanings, including those unrelated to "translation" and "translate" in their narrower "interlingual" senses. Could toransu トランス and its suru verb be used to mean "translation" and "translate"? It means "trance" -- or in chemistry, simply trans. But in specific contexts, it also abbreviates words like "transformer" (toransufoomaa トランスフォーマー) and "transgender" (toransujendaa トランスジェンダー). Imagine "Awesome trans!" from the mouth of an amplifier builder, a driver shifting gears, or a reader of Banana Yoshimoto's The Lake. "Understanding Dictionaries" (Ch. 9) will assure translators and editors who shrink from using new words, or old words in new ways, that even the most comprehensive lexicon can only list and restrict the meanings and uses of expressions its compilers know of and choose to include. It could expand forever, and never be able to definitively mark the limits of a language or stop its shores from changing. The shoreline of toransureeshon somewhat shifted in 2003 when the film Lost in Translation was released in Japan as ロスト・イン・トランスレーション. The titles in Hong Kong and Taiwan were 迷失東京 (Lost [in] Tokyo) and 愛情、不 用翻譯 (Love Needs No Translation). Distributors in Japan, too, undoubtedly considered several interpretive titles before concluding that a transliteration would translate into higher box-office returns. The bottom line will also govern whether, and how, Bellos's book is translated into Japanese. Publishers in Japan, as elsewhere, have numerous options when considering localization and marketing. Anything can be reworded or deleted if deemed misleading or wrong, of no interest, boring, too complicated, politically risky, tasteless, offensive, or libelous. Production costs and pricing can impose word and page limitations, forcing cuts. Not a few translations of fiction and non-fiction from English to Japanese, and vice versa, have been retailored to fit a different body of readers. The most radical alteration of Bellos's book for readers of Japanese would be a chōyaku 超訳. Bellos does not discuss this word, but it conspicuously ends his long citation of Emmerich's list of yaku compounds, where Emmerich glosses it "translations that are even better than the originals" of Sidney Sheldon and some other popular American writers, and adds that it is an "invention and registered trademark of the Academy Press" (p. 26). Chōyaku, however, means "super translation" in the sense of a very liberal rendering intended to be more readable and interesting than a conventional closer one, with the object of selling more copies. Academy Shuppan introduced the term in the late 1980s, but several publishers are also now using it in their titles of "ultra translated" early and more recent foreign and Japanese literary, religious, philosophical, and other classics. Academy Shuppan's website (viewed February 2012) explains in Japanese (to translate its key phrases and paraphrase the rest) that the object of chōyaku is "natural Japanese" -- achieved by adopting the "absolute requirement" that a translation "not lose sight of the intrinsic linguistic sensibilities of Japanese" -- just as one "creates a haiku within the 5-7-5 requirement." No more "awkward Japanese" that, though it may convey meaning, strives to reproduce every past tense, adjective, and relative pronoun. Goodbye to the "roundabout translationese" that has "forced the conventions of English-language grammar and society" on readers of Japanese -- while plaguing publishers, who end up selling "not even 20,000 copies of a besutoseraa novel that sold 2,000,000 in America." Bellos could give a publishing house permission to freely revamp his book without being shackled by its English versions. A chōyaku might shorten, embellish, restructure, supplement, even change the order of chapters or chop some, or drop the notes and index. And a poetic title might boost sales. Translation: In your ear, is that a fish? What else could a translation of Bellos's book -- as a naturalized product owing allegiance to the Japanese market -- lose of its original identity? In "What Can't Be Said Can't Be Translated: The Axiom of Effability" (Ch. 13), Bellos holds -- while swinging readers around the logic of a few philosophers -- that the ineffable can't be lost in translation because it's beyond expression, thus irrelevant to translation. Hence "translation teaches . . . that everything is effable" -- especially, he says, poetry. "Translation is the enemy of the ineffable" in that "One causes the other to cease to exist." While in this loop, which may be a foe of translation, Bellos places "crossspecies communication" in "the realm of the ineffable" -- because "nobody knows how to translate 'animal signals' into human speech or vice versa" except for a few "noises" and "signals" that pass between some domesticated pets and their owners. When I say "Shake hands!" to my daughter's dog Tuna, she yawns at me, then looks at my daughter as though to ask "What's he saying?" My daughter says "Shake hands!" and Tuna extends her right forepaw -- toward my daughter. I don't speak their dialect yet, so Tuna doesn't recognize me as a member of their community. Humans are of the same species, but interlingual communication between groups also comes down to community -- and is limited by what human languages essentially are. Bellos devotes his epilogue to this problem, which arises because human speech, he argues at length, evolved within scattered groups to "perform [some of] the social bonding functions of grooming." This is what languages originally were and continue to be "for" -- and only later did they come to be "used" to facilitate communication between groups. Speech between individuals establishes differences between them -- "I am not you but me," Bellos proclaims. And manners of speech peculiar to individuals who share them, including regional, clan, and class dialects, may convey feelings not effable to others. Broadly understood, he says, "language is ethnicity" in the sense of "how a social group constitutes and identifies itself." At the end of the epilogue, Bellos avers "It's not poetry but community that is lost in translation." Translation does "practically everything else" but fulfill the ineffable "community-building role of actual language use," he adds -- then rests his case like this. It is translation, more than speech itself, that provides incontrovertible evidence of the human capacity to think and to communicate thought. I think I know what this means, too. And if it means what I think it does, then translations are uses of actual languages that hold out hope for a more thoughtful, less savage world community. If I were still teaching translation, I would ask my students to put Bellos's closing lines into Japanese -- as a test of their ability to convey the shared human capacity of English to be splendidly fuzzy. A starchy, clarified Japanese version would be "deficient in precisely the respect" in which Bellos's essays are richer in their aim to intellectually stimulate and delight readers by keeping them a bit off balance. In the spirit of what Bellos reiterates throughout his book, and arguably its most important contention, a skillful translator would have lots of "elbow room" to exploit the flexibility of Japanese to keep bending in its ways -- as English continues to do in similarly different ways -- to portray a good likeness of the book's and his character. I don't imagine Bellos intended his book to be read this way. And perhaps it shouldn't be -- given that it's a collection of stories about translation as another word for what it means to be human -- a condition which, as long as people are mystified by themselves and others, will inspire those engaged in translation by any name. The Yanked and Britted editions of Is That a Fish in Your Ear? can be sampled through Amazon's "Look Inside!" feature (amazon.com and amazon. co.uk). The Wild Woolly Web also has an endless, if not yet quite infinite, number of reviews. And on YouTube, there's a wonderfully hilarious Penguin Books animated promotional video of Bellos talking about words for things (youtube.com).